If you are like most New Yorkers, you probably recycle. You probably feel a pang of guilt when you toss that empty tomato paste can in the garbage because you were too lazy to scrape it out. You may even use cloth towels and reusable wipes around the kitchen so as to avoid buying paper towels. But did you ever think about where you six-foot-tall Frasier Fir goes when the tinsel is off? You drag it out to the curb and then it's forgotten. Well, the Department of Sanitation drags it straight off to a landfill. That's like, what, 150 rolls of paper towels in one fell swoop. This is were the Parks Department saves the day. 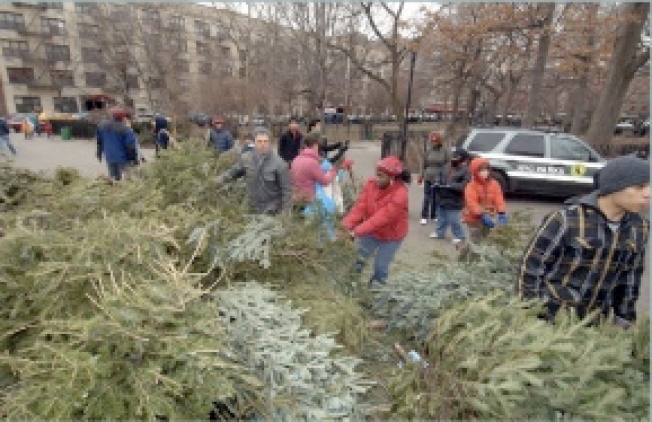 Saturday and Sunday, the Parks Department is giving city residents the chance to turn all those precious holiday memories into precious nourishment for the cities parks. from 10 a.m. until 2 p.m. bring your withering Christmas tree (sans ornaments, regardless of how much you would love to watch that glittery ball from your mother-in-law get chopped to bits) to one of the many drop-off locations throughout the city. Click here to find the location nearest you.